Blue Monday. The best-selling UK indie 12” of all time. Strangely for a song that was already perfection it has been remixed and re-released time after time, each version helping to keep it eternally popular in the dance club scene. Fellow Mancs 808 State created an acid house remix in 1988 which is one of the most well-known, and was often heard at the Hot nights in The Haçienda. Pretty good for something that started life as a tune the band could set playing on auto as they left the stage, to avoid doing an encore. So what makes this song so identifiable? The track opens with the most recognisable kick drum rhythm ever; then that unforgettable melody hits. An error meant the melody is slightly out of synch with the beat, but the band decided they liked the way that sounded and kept it like that. “Tell me how do I feel? Tell me now, how should I feel?” The lyrics are delivered in a detached way, almost an electronic lack of emotion (which will be relevant a few chapters from now). Synth bass lines pulse, played on a synthesizer Bernard Sumner built. A feature of many New Order songs is the focus on strong bass lines (guitar or electronic). Peter Hook often played bass as the lead guitar. The song breaks the rules, lasting an epic 7 and a half minutes with an unconventional structure. The original vinyl single’s sleeve looked like an 8” floppy disk. It adopted the usual New Order minimalism: it doesn’t name the band or song title, just the catalogue number FAC 73. The band and song title were encoded as coloured blocks in a system used on a few of their works. The sleeve was designed by Peter Saville, who also created the waveform cover for Joy Division’s iconic Unknown Pleasures. The original Blue Monday cover had a silvery inner sleeve that was so expensive to manufacture that Factory lost money every time they sold a copy (£1.10 to produce, but they sold them for £1, never expecting the song to be such a hit). In the early days many of New Order’s songs seemed to have no relation to the song title; occasionally titles would appear as lyrics in other songs. In this case Blue Monday comes from Breakfast of Champions, by Kurt Vonnegut, where “Goodbye Blue Monday” is written on a bomb. Hence the original video for this song: false colour and over-exposed military clips of marching soldiers, army vehicles, radars, and targeting computers; footage of the arcade game Zaxxon juxtaposed with bombers and missiles synched to the beat and clap machine. 1983’s finest Cold War computerised imagery, recalling lives lived in fear, mixed with industrial desolation of cities, motorways, car fetishism, and riots. Question: Where’d all that come from? Answer: Salford. New Order formed from the remaining members of Joy Division: Bernard Sumner, Peter Hook and Stephen Morris, plus they added Gillian Gilbert (Morris’s girlfriend). Musically they evolved from dark melodies reminiscent of Joy Division to their more well-known electronic dance, or synthpop, style. New Order had an ethos of doing whatever they wanted so they performed short gigs with no encores, and rarely gave interviews. They were flexible performers, and often swapped instruments around during gigs. Going back to Blue Monday’s fingerprint, New Order were no strangers to long songs. 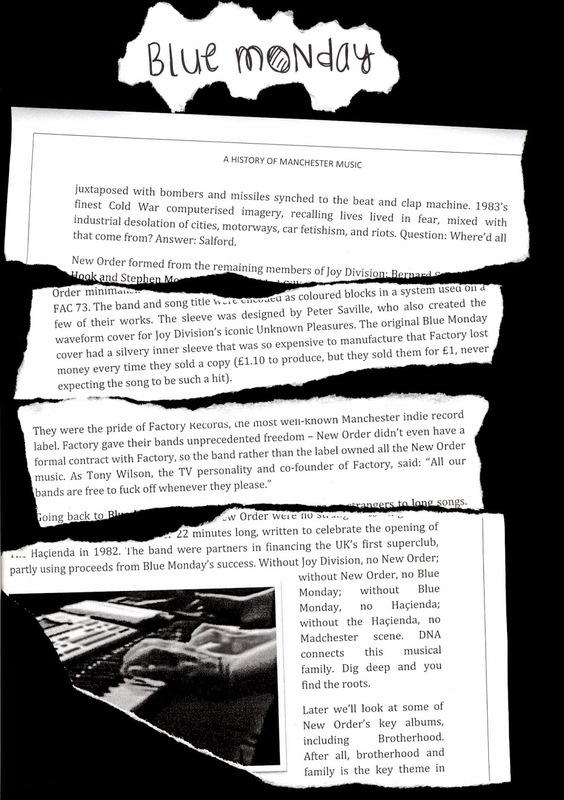 Their track Prime 5 8 6 was over 22 minutes long, written to celebrate the opening of The Haçienda in 1982. The band were partners in financing the UK’s first superclub, partly using proceeds from Blue Monday’s success. Without Joy Division, no New Order; without New Order, no Blue Monday; without Blue Monday, no Haçienda; without the Haçienda, no Madchester scene. DNA connects this musical family. Dig deep and you find the roots. Later we’ll look at some of New Order’s key albums, including Brotherhood. After all, brotherhood and family is a key theme. DNA, again. 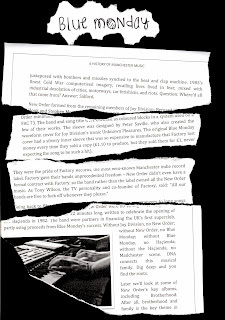 Extract from page 98 of 2000 Tunes: A History of Manchester Music by M. H. Rees; used with permission. Read the whole series (25 extracts) here; or my summary post. Readers might be interested in my forthcoming novel about a man obsessed with Manchester music - confusingly, it is also called 2000 Tunes!